The Green Girl was forced to replace her SanDisk Sansa Clip+ MP3 Player when it refused to power on. 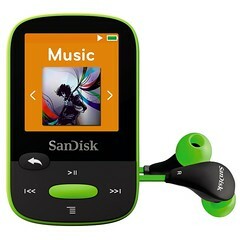 I replaced it with a SanDisk Clip Sport 8GB MP3 Player in Lime. Getting a new MP3 player inspired me to update my running playlist. I completed a disappointing 19/100 Things in 2014. This year I shifted my focus to self-improvement/development and expanding/enriching Jade's life experiences.